For the uninitiated among you (or Millenials), Dungeons & Dragons (D&D) inspired countless video games in the Role Playing Game (RPG) genre including World of Warcraft and the Elder Scrolls series including Oblivion and Skyrim. In a round of D&D you get together a group of friends IRL (that’s shorthand for “In Real Life” for our Baby Boomer and Gen-X readers) with one of your friends telling a story of the adventure using words spoken aloud (not texted or even IM’ed! For our older readers, that’s Instant Messaging). The storyteller, called the “Dungeon Master” or DM for short, plans the adventure in advance while everyone else uses their imaginations (those things Nintendo made extinct decades ago) to take part. Players roll dice to determine almost all the activities in the game including the outcome of battles, casting spells, and using the restroom. What? Didn’t everyone’s DM make them roll 2D6 to determine whether or not their character properly took care of business? Cafiero will wage an epic battle on hunger with his first D&D event appropriately titled “Orcs! Orcs! Orcs!” on September 4 with a meal featuring dishes inspired by the epic fantasy world. We’re pretty sure Cafiero’s dishes are far more appetizing than the Game of Thrones Dolthraki blood pie Binging with Babish, one of our favorite food YouTubers, made in a recent video. So far, Cafiero’s thinking whole pig, homemade pickles, cheeses, and jams served with Ken’s Artisan Bakery bread and a mug of punch. Of course, there will be vegetarian options (although we’re thinking the orcs would not approve, maybe half-elves would?). 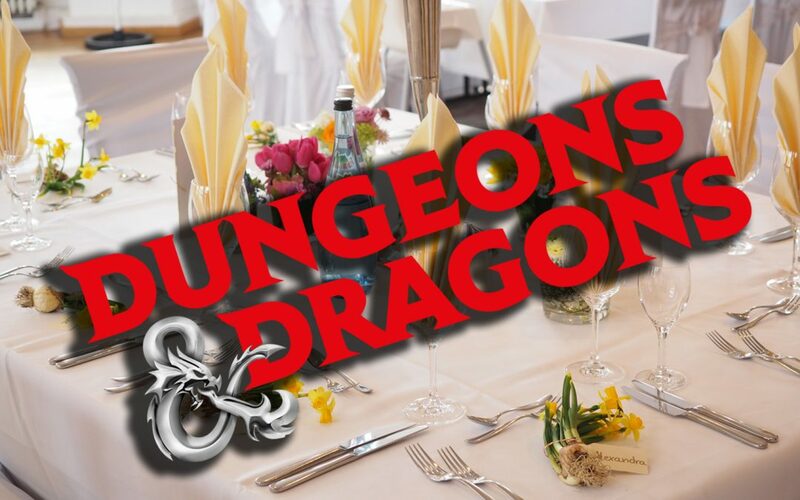 Actual Dungeons & Dragons games will follow the meal with five DMs running the table for up to 20 guests divided into groups of four. Tickets for dinner can be procured from Feastly for a very reasonable $20 and participating in the after-dinner role-playing extravaganza is only an extra Jackson. We’re searching for a local credit union that can exchange our GP (gold pieces) into American cash. What other themed restaurants do you think Portland should have? Leave your suggestions in the comments!